Clinton doing reasonably well at putting Obama coalition back together — maybe as well as Obama would. The robo-pollsters of Public Policy Polling have a new batch of battleground-state polls out today. The top-line findings are that Clinton holds very narrow leads among likely voters in Florida and North Carolina, and somewhat more comfortable (but still single-digit) leads in Colorado, Pennsylvania, and Virginia. PPP also shows voters in all five states agreeing that Clinton won the first candidate debate, with millennials — a demographic with special strategic value to her — agreeing with that assessment most emphatically. The received wisdom, you see, is that Clinton’s as bad a candidate as Democrats could have possibly chosen and is struggling to put the Obama coalition back together, with some direct and indirect help from the incumbent, who is much more popular than his putative successor. According to PPP, however, Obama wouldn’t be doing that much better if he were able to run for a third term. 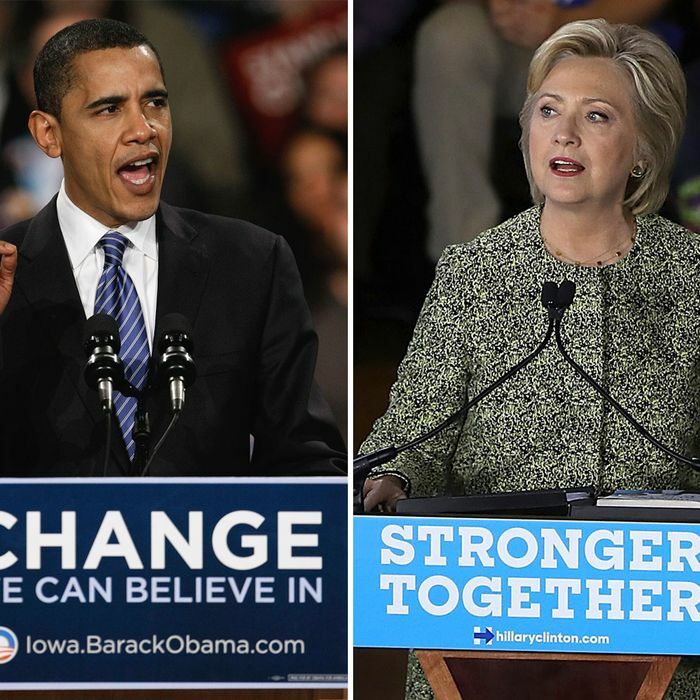 In Pennsylvania, Obama’s running dead even with Clinton; both lead Trump 49-44. In Colorado, there’s a one-point difference: Obama leads Trump 52-43, Clinton leads the mogul 51-44. There are slightly larger differences in Virginia (Obama 53-43, Clinton 49-43), North Carolina (Obama 53-43, Clinton 49-45), and Florida (Obama 50-47, Clinton 48-45). Looking at the cross tabs, Clinton’s performance among Obama-coalition elements is reasonably strong as well, though in Colorado, North Carolina, and especially Virginia, she’s losing far too many under-30 voters to Gary Johnson. (My colleague Eric Levitz has a recommendation today on how she might solve that problem.) In a two-way trial heat, she’s over 60 percent among under-30s in Colorado and Florida, and in the 50s elsewhere. All in all, these numbers are a testament to the power of partisan polarization — and a corrective to the natural tendency to view elections as popularity contests. Ds and D-leaning independents are mostly going to vote for Clinton as they would have voted for Obama, and Rs and R-leaning independents are mostly marching into Trump’s camp, just as they would have against theoretically stronger Democratic nominees. And that’s why the contest is close regardless of this or that “bump” for this or that candidate.